Villa Ride, St Barts. 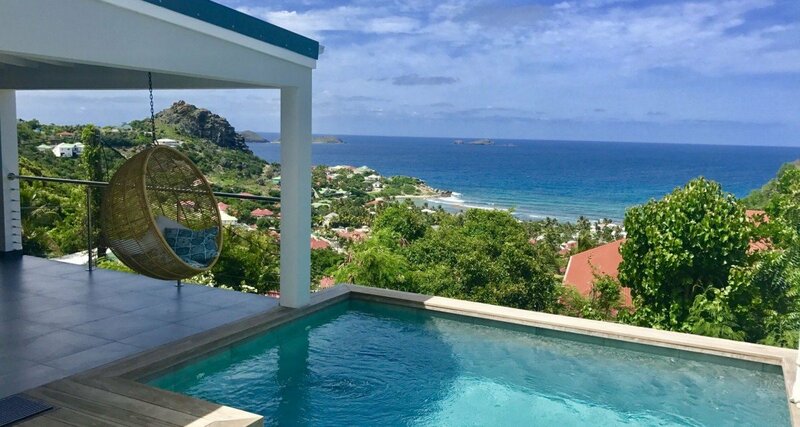 Villa Ride is a private St. Barts getaway, perched high above the rest of the world. Upon your own hillside, you’ll have the view of a lifetime. This is the ideal place to enjoy the amazing Anse de Cayes area. 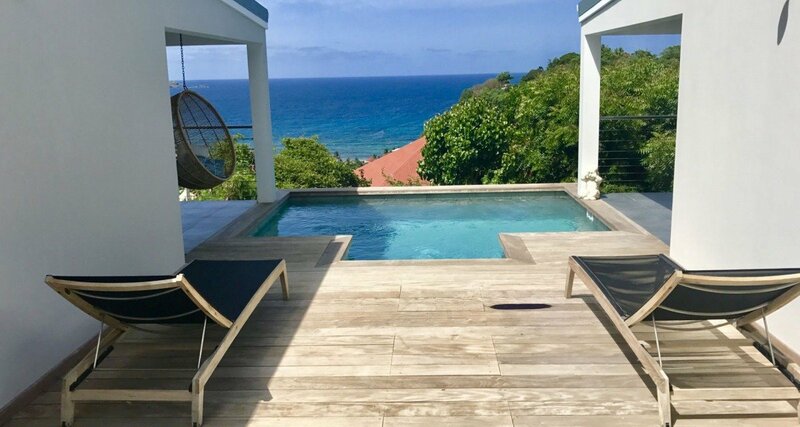 You are just a few minutes away from Gustavia Harbor and the airport, but you’d never know it – your own luxury resort at Villa Ride is set apart. 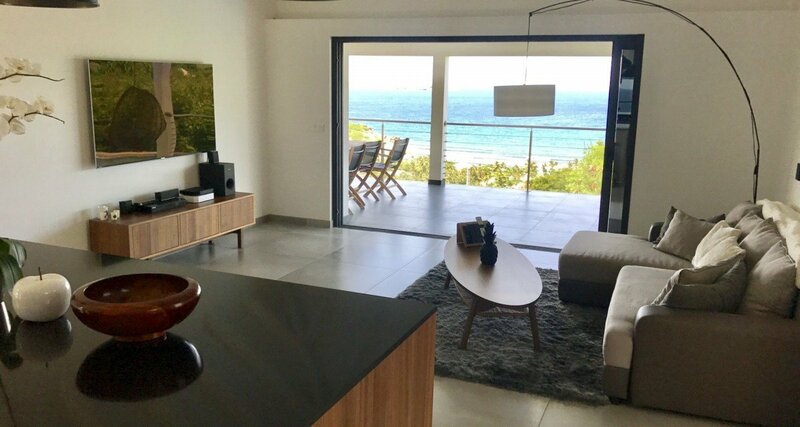 Designed by owners that love to surf, the home was made to feel as though you are riding the waves, with contemporary and comfortable island décor. Sleek, glossy lines throughout the home make it feel like you are being whisked away by the sparkling waters of the Caribbean Sea, which is on full and stunning display through every window. This is a two-bedroom, two bathroom home, perfect for a pair of couples, a small family, or a romantic getaway for just the two of you. The two suites are both spacious, with access to a terrace, and are separated into different structures. The first is in the main home, with the kitchen and living space. The second is in a small, private bungalow on the other side of the pool. You can open each bedroom up to the outdoors with a floor-to-ceiling sliding glass door that makes up one entire wall. This is a great way to invite the sea breeze to lull you to sleep each night. The entire home is designed to allow you to slip between the indoors and outdoors seamlessly. The pool is right outside the living area, and there is tons of both shade and sunny lounging area. A barbeque pit in the back is kept protected from the wind. 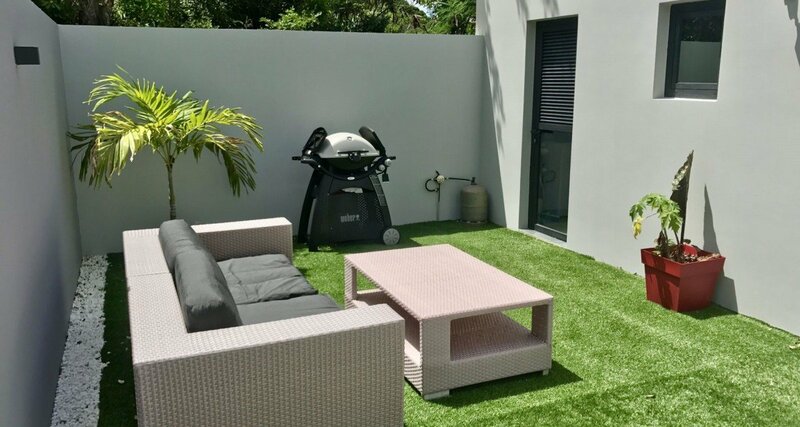 The property includes all the modern amenities you need, including Wi-Fi, an Apple TV, and more. There is a housekeeping service available during your stay, and you also have access to a personal concierge who can help you explore St. Barts in an instant. Because of the location, it’s a good idea to have a small four-by-four vehicle with you to traverse the path down and up. But the amazing views and the total privacy in a tropical heaven are worth it! Wake up to the sound of birdsong and fall asleep to the music of the ocean breeze at Villa Ride – the ideal hilltop resort for anyone that needs some distance from the daily grind.